On April 3, 1973, Martin Cooper, the head of the systems division at Motorola, took a stroll that changed history. From a busy New York City sidewalk, he made the first portable cellular telephone call, opening a new era in telecommunications. It would take another decade to shrink Cooper’s bulky, $4,000 prototype to the early versions of today’s sleek, inexpensive and powerful Personal Digital Assistants (PDAs), cell phones and smartphones, but change was underway. No longer would people be tied to their home or office computers. By 2013, the number of mobile devices accessing the Internet is expected to surpass one billion, according to market research by International Data Corporation (IDC). And this in turn offers an opportunity for the National Library of Medicine to transmit information in new and different ways. 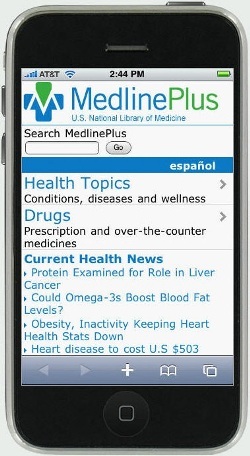 One of NLM’s newest mobile products is Mobile MedlinePlus, which launched January 2010. There’s an obvious audience for it. The market research firm Manhattan Research reports the number of people using mobile devices for health information doubled from 10 to 20 million between 2008 and 2009. Mobile MedlinePlus offers health and prescription information in English and Spanish. It is a spinoff of NLM’s popular Web site MedlinePlus.gov and contains a selected subset of content from the original site. Designing content for mobile devices and creating an open system that allows access to a large number of diverse mobile devices were the greatest challenges in bringing Mobile MedlinePlus online, said Loren Frant, head of the Health Information Products Unit. “We picked ‘snackable bits’ of information that we could support,” she recalled. “Some applications on the main site just cannot be supported on the mobile site.” An example is Flash Video, an application for delivering video over the internet offered by Adobe that is used on the MedlinePlus site, but not on the mobile site. By far the most important decision made during the design process for Mobile MedlinePlus was to embrace an open system that would support many different types of mobile devices. To accomplish this, the designers created a Web site that allows access to mobile devices and even recognizes the user’s device type and accommodates the display to fit that device. This is in contrast to simply creating an application, which works only for a single device. And that decision to create a separate Web site with open access has paid off. “We haven’t heard from a single user who could not access the site,” Frant said. Also this year, NLM created its first publicly downloadable iPhone application. After the earthquake that devastated Haiti in January, NLM developed an interactive Web site with pictures and information about people who were found or are still missing. Medical and relief workers could submit material through a computer, cell phone or a special Found in Haiti iPhone app. In the following months, a second, more advanced iPhone app for reuniting families after a disaster was developed and deployed. ReUnite, as it’s called, can be used anywhere the US government responds to a disaster. Sameer Antani, PhD, in the NLM Lister Hill National Center for Biomedical Communications, developed the apps. They are an outgrowth from a Lost Person Finder project spearheaded by colleague Michael Gill. ReUnite was recognized as one of Apple’s “New and Noteworthy” iPhone apps and had more than 1,250 registered downloads less than a week after release. NLM was actually ahead of the recent mobile device boom. Almost a decade ago, researchers began exploring two different ways to make NLM’s PubMed database accessible through mobile devices so clinicians could search for medical literature at the point of care. PubMed on Tap, later dubbed MEDLINE Database on Tap or MD on Tap, was developed by Susan Hauser, PhD, formerly of the Lister Hill Center, and uses client server software. PubMed for Handhelds allows searches with the Web browser of any wireless mobile device. Paul Fontelo, MD, MPH, also with the Lister Hill Center, is one of the pioneers of mobile access at NLM. He worked on the original PubMed for Handhelds project since its beginning in 2001. At the time, there were no smartphones or wireless PDAs and data had to be downloaded directly to the device. Fontelo and others on the projects saw a great opportunity. PDAs would get better, smarter, and smaller and become a must tool for physicians and health care providers allowing access to a vast trove of medical information and resources on the Internet. But first, the NLM needed to build the sites for mobile access. “It was a great opportunity to give clinicians access to information and make clinical decisions related directly to their patients,” Fontelo recalled recently. Those clinicians obviously concurred. For example, during its first full year, PubMed for Handhelds had 410 searches. Last year, there were more than 88,000. The MD on Tap client software, originally written for the Palm and other Microsoft Windows Mobile platforms, still continues to be downloaded, though the research project itself concluded after extensive onsite testing at the University of Hawaii hospital and other sites. As mobile technology takes off, the job of training users grows in importance. Dale Prince is the Technology Coordinator for the Southeastern/Atlantic Region of the National Network of Libraries of Medicine, a program run by NLM. He is an unapologetic believer in the future of mobile medicine. “Mobile devices are the next great thing to set the world on fire,” he declared. ← What Does a Library Have to Do with Disasters?